Loved by many, these waffles are a Philip Jones favorite! 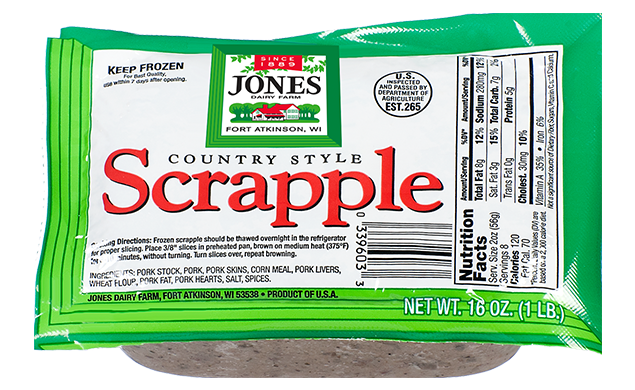 After crisping in the waffle iron, scrapple is topped with a sweet apple compote. 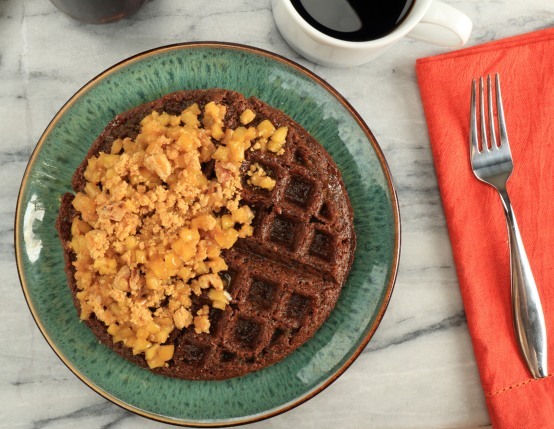 Take half defrosted scrapple and crumble into hot waffle iron. Close iron, cook for 12 minutes. Repeat process for second waffle. To make apple compote: Place non-stick pan over medium heat, add small diced apples, 3 tablespoons softened butter, orange juice, and brown sugar. Cook 15 minutes until orange juice is reduced to light syrup. To make graham cracker crumb topping: In separate bowl mix graham cracker crumbs, 3 tablespoons softened butter, white sugar, and all-purpose flour. Place in refrigerator, butter will slightly harden. In small sauté pan over low heat, toast chopped walnuts until slightly browned. Top cooked scrapple waffles with apple compote, graham cracker crumb topping, toasted walnuts and maple syrup then serve!